Where are Russia’s vast gold reserves hidden? While Russia does not have a Fort Knox, almost two-thirds of the nation’s gold is kept in a Central Bank repository in Moscow. The rest is stored away in St. Petersburg and Yekaterinburg. The topic of gold reserves is increasingly discussed in the international media. Donald Trump, for example, suggested an audit of America's gold reserves to ascertain just how much the country truly has. 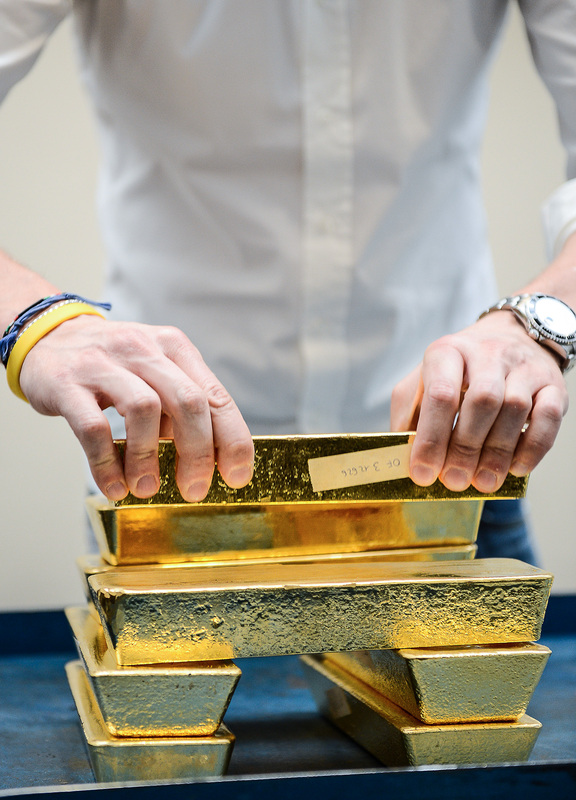 The question of Germany's gold reserves, kept in the U.S. for decades, has begun to worry the German public, which begins to think it’s necessary to return those reserves home. So, it’s no surprise that many Russians also wonder what’s up with their country’s gold reserves and where they’re hidden. Russia ranks sixth in the world in gold reserves, and the Russian Central Bank said they total 1,614.27 tons, which is 15 percent more than last year. The Russian Central Bank is one of the world’s leading gold buyers, and in February 2016 it purchased more than 10 tons of gold. "When prices are low governments increase gold reserves, and this often owes to traditions and historical reasons," said Anton Tabakh, an economist and professor at the Higher School of Economics. "In the reliability-liquidity-profitability triad, gold is marketable but prices greatly vary." Experts positively view Russia's determination to increase gold reserves during global economic uncertainty. Konstantin Sakharovsky, who worked many years as director of innovations at a large Russian jewelry retail company, believes that a Trump presidency means gold will have more significance. "Increasing the share of gold reserves is a very good decision in today's economic and political climate," said Sakharovsky, who links the increase demand for gold to the political risks tied to the election of the new U.S. president. "Trump is unpredictable," said Sakharovsky. "There could suddenly be a new wave of sanctions and a freezing of assets. Gold will help Russia maintain its assets. Of course, there are also problems related to a possible drop in gold prices, but all this can be hedged." Fort Knox on Pravda Street? While Russia does not have a Fort Knox, almost two-thirds of the nation’s gold is kept in a Central Bank repository in Moscow. The rest is stored away in St. Petersburg and Yekaterinburg. The gold is kept in bullions weighing from 100 grams to 14 kilograms. Information on these storage locations is a tightly guarded secret, but rumor says that one location is on Pravda Street in central Moscow. Ironically, this street is home to offices of Russian media that have little idea of what secrets might be right under their noses. In 2011, then Prime Minister Vladimir Putin inspected one such 17,000-square-meter storage center, but details of the visit were not given. Putin is considered the main instigator of replenishing the gold reserves because he believes that gold and foreign currency reserves are a guarantee of Russia's financial independence. Russia’s fondness for gold reserves dates to the czars, who used gold to strengthen the national currency. The Russian empire attained its largest gold reserves in 1894 when they amounted to 800 million imperial rubles. Until 1914 the gold reserves of the Russian Empire were the largest in the world, weighing 1,400 tons. The vast quantity of gold allowed Finance Minister Sergei Witte to carry out monetary reforms, which resulted in the introduction of the gold standard in 1897. Why did Soviet Union's most notorious would-be-assassin shoot at Brezhnev? The First World War, and the subsequent Russian Revolution, depleted gold reserves in order to obtain credit from foreign banks. After the Bolshevik coup in October 1917, a part of the czarist gold was moved to Siberia by the forces of Admiral Alexander Kolchak, who commanded the White army. Some of this gold remained in Russia, but not all of it, said Vladlen Sirotkin, a professor at the Russian State University for the Humanities, who has written extensively on "Kolchak's gold." The admiral sent a significant share of the gold reserves to Japan to buy weapons, but received neither the weapons nor the gold. According to Russian researchers (in Russian), "Kolchak's gold" weighed about 60 tons. Like the U.S. today, Czarist Russia offered services for storing gold to other countries. During World War I, for example, the Romanian Kingdom, which was a Russian ally, feared German occupation and decided to send its gold reserves to Russia. In total, 95 tons of Romanian gold ended up in Russia. Although the Soviet Union promised to return the gold to "the people of Romania," the Kremlin did not rush, distrustful of the Romanian Communist leader, Nicolae Ceaușescu, whose relations with Moscow were strained. The last part of the Romanian gold was returned to Bucharest only in 2008. The Bolshevik government quickly spent the czarist gold reserves to buy food and industrial equipment, and by 1928 only 150 tons remained in the Soviet treasury. During Stalin’s rule, however, the country's gold reserves grew substantially because the Soviet leader believed such reserves were an important pillar for the economy's fast-paced industrialization. Stalin left 2,500 tons of gold in the state reserves, but after Khrushchev’s rule that figure decreased to 1,600 tons, which was almost entirely erased under Brezhnev who left 437 tons. Andropov and Chernenko slightly increased the national gold inheritance to 719 tons, but Gorbachev delivered the final blow to the Soviet gold reserves, and in October 1991 only 290 tons remained. Most of Russia's gold mines are located in the Far Eastern region of Magadan, a place known for cruel Gulag camps where many people died during Stalin's rule. Magadan, however, has also played a positive role in the development of the country with its gold mining. In 2005, Magadan hosted a government meeting on gold chaired by President Putin that sought a solution for the critical situation with the country's gold reserves. At that time the repositories contained only 387 tons of gold and the condition of the industry was catastrophic. New measures were adopted to improve the situation in the industry, which had been working according to old rules from the Soviet era. The meeting turned out to be revolutionary for the industry, and it was decided to find ways to attract private investment in exploration. Improving transparency was the most important result. Since Soviet times gold production had been one of the most corrupt industries. "The chairmen of joint adventures who remained faithful to their principles didn’t work too long," wrote the Soviet geologist Alexander Surkov in his book, Quiet Toilers and Caribbean Pirates. Today the pirates are gone, and the "quiet toilers" are working intensively to once again increase the country's gold reserves.